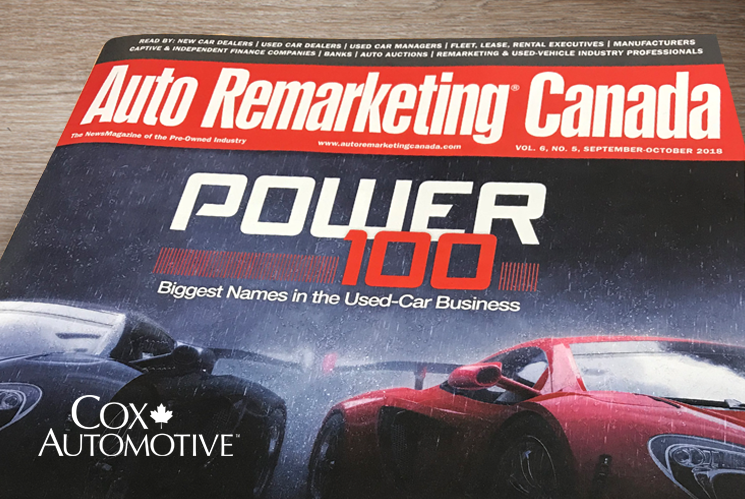 Mississauga, Ont.—October 22, 2018—Cox Automotive Canada has been named to Auto Remarketing Canada’s Power 100 list, a select list of major players in the remarketing and used-car worlds. According to the publication, companies profiled within the issue, released last week, are considered Canada’s biggest names in the used-car business. Many of the companies listed within the issue are described as well-known anchors of the business, while others have just started to make waves. Cox Automotive Canada President, Maria Soklis, was quick to praise the publication for releasing such a comprehensive list. From auction companies to OEMs, digital marketing organizations, and more, the Power 100 issue salutes the corporations that have made the remarketing industry what it is today. Manheim Canada is part of Manheim, the leading global provider of vehicle remarketing services for more than 70 years. With locations in Halifax, Moncton, Montreal, Toronto, Edmonton, and Vancouver and 24/7 sales via www.ove.com, Manheim Canada hosts more than 30 in-lane and online auctions each month. Manheim connects buyers and sellers of used vehicles to the world’s largest wholesale used-vehicle marketplace, helping dealers and commercial customers achieve results through auction channels, data analysis, inspections, financing, transportation, purchase protection, mobile products and a wide range of solutions. For more information, visit manheim.ca.